The Moon (or Luna) is the Earth’s only natural satellite and was formed 4.6 billion years ago around some 30–50 million years after the formation of the solar system. The Moon is in synchronous rotation with Earth meaning the same side is always facing the Earth. The first unmanned mission to the Moon was in 1959 by the Soviet Lunar Program with the first manned landing being Apollo 11 in 1969. The dark side of the moon is a myth. 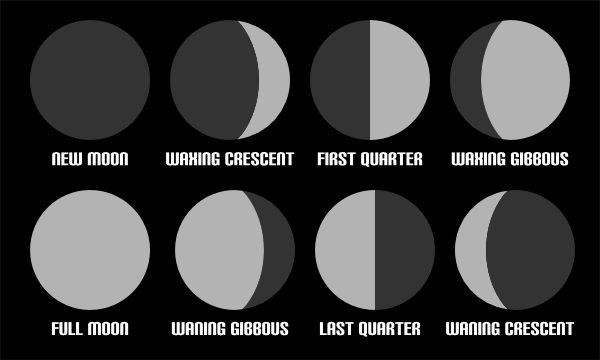 In reality both sides of the Moon see the same amount of sunlight however only one face of the Moon is ever seen from Earth. This is because the Moon rotates around on its own axis in exactly the same time it takes to orbit the Earth, meaning the same side is always facing the Earth. The side facing away from Earth has only been seen by the human eye from spacecraft. The rise and fall of the tides on Earth is caused by the Moon. There are two bulges in the Earth due to the gravitational pull that the Moon exerts; one on the side facing the Moon, and the other on the opposite side that faces away from the Moon, The bulges move around the oceans as the Earth rotates, causing high and low tides around the globe. The Moon is drifting away from the Earth. The Moon is moving approximately 3.8 cm away from our planet every year. It is estimated that it will continue to do so for around 50 billion years. By the time that happens, the Moon will be taking around 47 days to orbit the Earth instead of the current 27.3 days. A person would weigh much less on the Moon. The Moon has much weaker gravity than Earth, due to its smaller mass, so you would weigh about one sixth (16.5%) of your weight on Earth. This is why the lunar astronauts could leap and bound so high in the air. The Moon has only been walked on by 12 people; all American males. The first man to set foot on the Moon in 1969 was Neil Armstrong on the Apollo 11 mission, while the last man to walk on the Moon in 1972 was Gene Cernan on the Apollo 17 mission. Since then the Moon has only be visited by unmanned vehicles. This means that the surface of the Moon is unprotected from cosmic rays, meteorites and solar winds, and has huge temperature variations. The lack of atmosphere means no sound can be heard on the Moon, and the sky always appears black. These are caused by the gravitational pull of the Earth. Lunar astronauts used seismographs on their visits to the Moon, and found that small moonquakes occurred several kilometres beneath the surface, causing ruptures and cracks. Scientists think the Moon has a molten core, just like Earth. The first spacecraft to reach the Moon was Luna 1 in 1959. This was a Soviet craft, which was launched from the USSR. It passed within 5995 km of the surface of the Moon before going into orbit around the Sun. 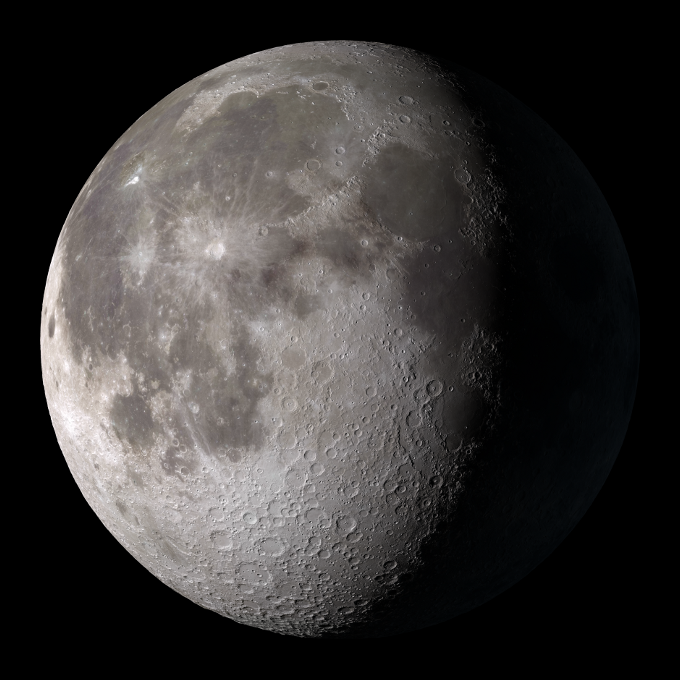 The Moon is the fifth largest natural satellite in the Solar System. At 3,475 km in diameter, the Moon is much smaller than the major moons of Jupiter and Saturn. Earth is about 80 times the volume than the Moon, but both are about the same age. A prevailing theory is that the Moon was once part of the Earth, and was formed from a chunk that broke away due to a huge object colliding with Earth when it was relatively young. The Moon will be visited by man in the near future. NASA plans to return astronauts to the moon to set up a permanent space station. Mankind may once again walk on the moon in 2019, if all goes according to plan. During the 1950’s the USA considered detonating a nuclear bomb on the Moon. The secret project was during the height cold war was known as “A Study of Lunar Research Flights” or “Project A119” and meant as a show of strength at a time they were lagging behind in the space race. Where is the Moon in our solar system?